Introduction. 1. Mathematical Preliminaries. Submodular Systems and Base Polyhedra. 2. From Matroids to Submodular Systems. Matroids. Polymatroids. Submodular Systems. 3. Submodular Systems and Base Polyhedra. Fundamental Operations on Submodular Systems. Greedy Algorithm. Structures of Base Polyhedra. Intersecting- and Crossing-Submodular Functions. Related Polyhedra. Submodular Systems of Network Type. Neoflows. 4. The Intersection Problem. The Intersection Theorem. 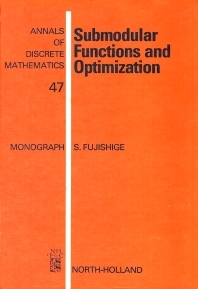 The Discrete Separation Theorem. The Common Base Problem. 5. Neoflows. The Equivalence of the Neoflow Problems. Feasibility for Submodular Flows. Optimality for Submodular Flows. Algorithms for Neoflows. Matroid Optimization. Submodular Analysis. 6. Submodular Functions and Convexity. Conjugate Functions and a Fenchel-Type Min-Max Theorem for Submodular and Supermodular Functions. Subgradients of Submodular Functions. The Lovász Extensions of Submodular Functions. 7. Submodular Programs. Submodular Programs - Unconstrained Optimization. Submodular Programs - Constrained Optimization. Nonlinear Optimization with Submodular Constraints. 8. Separable Convex Optimization. Optimality Conditions. A Decomposition Algorithm. Discrete Optimization. 9. The Lexicographically Optimal Base Problem. Nonlinear Weight Functions. Linear Weight Functions. 10. The Weighted Max-Min and Min-Max Problems. Continuous Variables. Discrete Variables. 11. The Fair Resource Allocation Problem. Continuous Variables. Discrete Variables. 12. The Neoflow Problem with a Separable Convex Cost Function. References. Index.